Buffon's needle problem is one of the oldest problems in the theory of geometric probability. It was first introduced and solved by Buffon in 1777, and involves dropping a needle of length at random on a plane grid of parallel lines of distance units apart and determining the probability of the needle crossing one of the lines. The desired probability is directly related to the value of , which can then be estimated by Monte Carlo experiments. 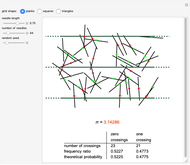 Three main factors influence these experiments: grid shape, grid density, and needle length. In statistical literature, several experiments depending on these factors have been designed to increase the efficiency of the estimators of and to use all the information as fully as possible. 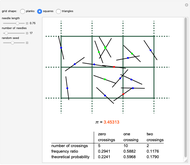 In this Demonstration, we can throw Buffon's needles on the three types of grids, all with unit grid height : planks, squares, and triangles (known as single, double, and triple in statistics literature). 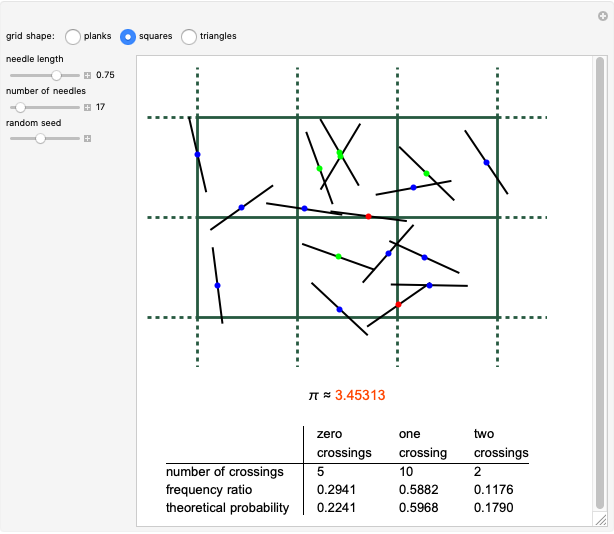 When a needle is thrown at random on these planes, the number of possible crossings are two, three, and four, respectively. 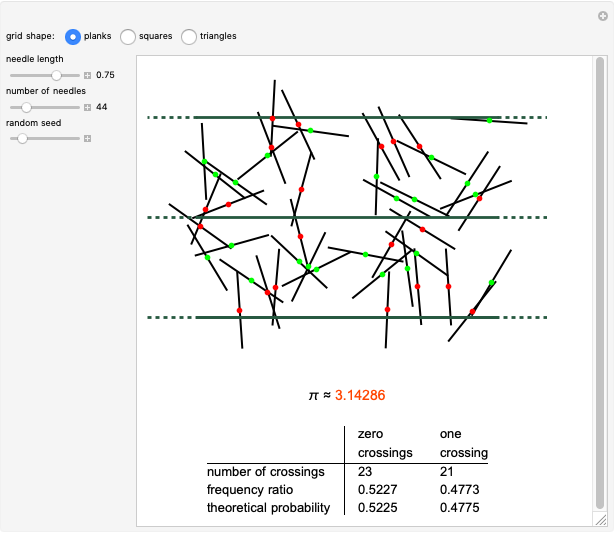 In the Demonstration, we can see the theoretical probabilities and the frequency ratios of these crossings. For each grid, as the number of needles gets larger, it could be expected that the difference between the estimated and actual values of would get smaller. We can also expect that as the ratio of needle length to grid height (i.e., ) grows, we get better estimates. The single grid (planks) is the most efficient in obtaining the tightest estimates of . E. Siniksaran, "Throwing Buffon's Needle with Mathematica," The Mathematica Journal, 11(1), 2008 pp. 71–90. 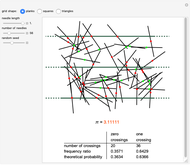 www.mathematica-journal.com/issue/v11i1/BuffonsNeedle.html. 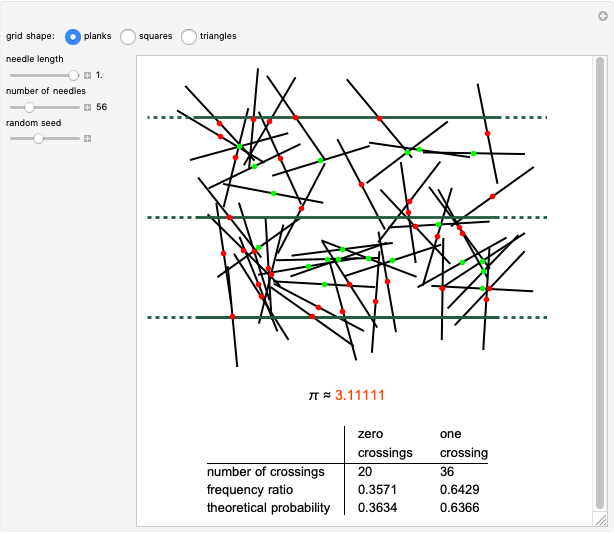 Enis Siniksaran "Buffon's Needle Experiment for Three Types of Grids"